With three kids between the ages of four and eleven, it can be somewhat of a challenge to make sure everyone actually has brushed teeth twice a day. Mine, in particular, have a talent for being sent to brush teeth, and yet somehow manage not have done it after emerging from the facilities. Mine also have a tendency to not always grab their own brushes. This drives me nuts. Really. My solution? 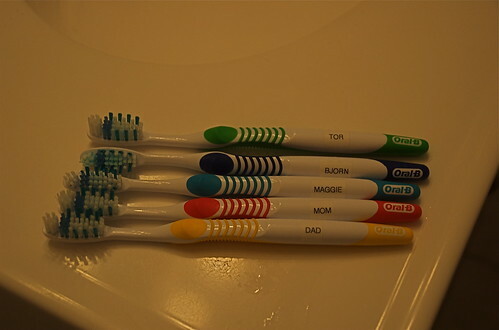 I picked up a multi-pack of tooth brushes in a variety of colors and had each member of the family choose theirs. Luckily for me, my kids all took this very seriously and even chased their Dad down to make sure he made his selection. Not content to leave it at that (because knowing which color is theirs hasn’t always worked in the past), I lugged out the other love of my life: my Brother P-Touch, which my mother-in-law bought me for Christmas many years ago. She laughed when I requested it, she laughed when she saw the proof of my fanatic labeling of things, and I know she’ll get a good chuckle at seeing how I’ve labeled out toothbrushes. Just know that my littlest, especially, is super proud to use his very own green toothbrush and will happily read out the letters of his name for you. T-O-R.
Also? No one but me has used my toothbrush since I did this. I consider my experiment a success!